No matter how beautiful something is on the outside, it’s important to remember that it’s what’s inside that counts. More than just a good life lesson, this truism actually pretty perfectly describes the new 2016 Chevy Camaro – although strikingly designed with seemingly limitless available customizations for that unique touch, what really makes this Camaro such an impressive model is its drivability. After a sizeable refresh, this new generation of Camaro offers exceptional driveability – this, thanks to an all-new lineup of six available powertrain combinations, with three available engines paired to a six-speed manual or available eight-speed automatic transmissions. These advancements in engine hardware only help to further secure the Camaro’s place as Motor Trend’s 2016 Car of the Year. The Camaro’s basic LT trim level comes standard with Chevy’s Ecotec 2.0 turbo engine, the first turbocharged engine to be featured in a Camaro. This powerful four-cylinder is capable of putting out an SAE-certified 275 horsepower and 295 lb-ft of torque for impressive performance on demand. For a standard engine option, this is an impressive and carefully constructed piece of hardware, with precisely planned engine features like a two-stage variable-displacement oil pump and an air-to-air intercooling system. This little turbo delivers a surprising amount of power and definitely lives up to its Camaro name, able to accelerate from zero to 60 mph in less than 6 seconds. And since this efficient engine offers more than 30 mpg on the highway according to GM, it is officially the most fuel-efficient Camaro ever made. This engine comes paired with an all-new Hydra-Matic 8L45 paddle-shift eight-speed automatic transmission or a manual six-speed transmission. In an impressive show of pure performance power, the Camaro LT also offers Chevy’s all-new 3.6-liter V-6 engine. Built to outstrip the competition, this engine offers the highest specific output for a naturally aspirated V-6 currently available, churning out an SAE-certified 335 horsepower and 284 lb-ft of torque. 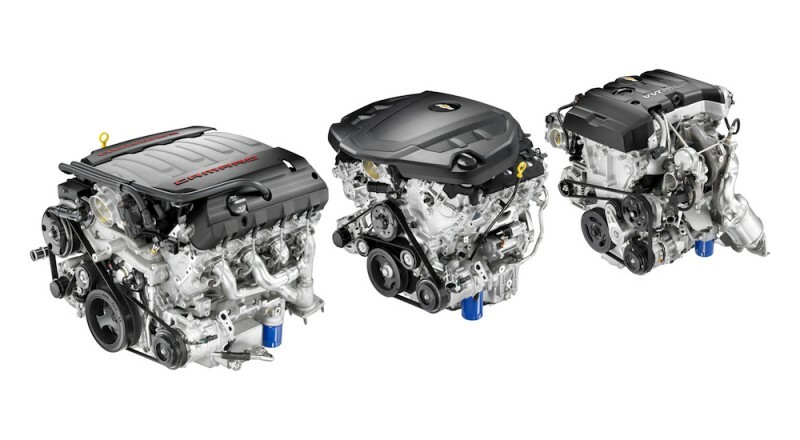 Although one might expect an engine this powerful to be terribly inefficient, Chevy has surprised us all by including Active Fuel Management cylinder deactivation technology, which disables two of the 3.6L V-6’s cylinders under light throttle applications to enhance efficiency. Thus, the LT’s six-cylinder only does the work of a four cylinder when it can get away with it, but can jump right back into full power at a moment’s notice. This impressive engine is built on the successful design of the Camaro’s previous V-6 engine, including an aluminum cylinder block and a carefully designed optimal 60-degree cylinder angle held over from the last model. This engine improves on that one by including upgraded features like an all-new lubrication system with a variable-displacement, two-stage oil pump that improves efficiency; new, higher-flow cylinder heads that enhance direct-injection performance; and a new “targeted” cooling system, among many others. As far as powerful V-6 options go, this is certainly a good one, available with the standard 8L45 automatic eight-speed transmission also found on the EcoTec 2.0L. The 3.6L V-6 also comes with Chevy’s manual six-speed transmission, which features Active Rev Match technology that automatically “blips” the throttle for perfectly timed downshifts. And thanks to a $390-million investment from GM, these all-new V-6 engines are built right here in America at the Romulus Engine Operations powertrain assembly facility, near Detroit. If at some point this year you find yourself driving what is literally the most powerful Camaro ever, then you must be experiencing the amazing power of the Small Block 6.2L LT1 V-8 engine. Rooted in unparalleled performance, this engine can produce an SAE-certified at 455 horsepower and 455 lb-ft of torque, far outstripping its predecessors and offering a whole new level of racing power to the striking Camaro SS. Featuring plenty of Camaro-specific architecture in its inner construction and notable improvements over the Camaro’s previous LS3 engine block, this new system has been extensively analyzed and adjusted to optimize everything from fuel injection to intake and exhaust valve positions. The results, evident in the Camaro’s impressive performance power, speak for themselves. Among many other impressive improvements, the LT1 also comes with the same Active Fuel Management cylinder deactivation technology with the six-speed manual transmission seen in the 3.6L V-6. Rather than two cylinders, however, this engine shuts down four of its cylinders during periods of light throttle applications. As a result, the SS’s amazing LT1 eight-cylinder can actually function as a four-cylinder when it need to – greatly improving low-level efficiency – while still abe to automatically ratchet back up to a V-8 at any time. That, Camaro lovers, is versatility. Long-time Camaro lovers might recognize the LT1 line from two previous generations of small-block engines, one used in GM vehicles from the 1970s and one from the 1990s. Because of this engine’s impressive construction an unparalleled performance, it was appropriately dubbed with the LT1 moniker, marking its quality for all to see. The LT1 engine block also comes with an available eight-speed automatic transmission, much like the EcoTec 2.0L and the 3.6L V-6. This, however, is the slightly larger and heavier 8L90 eight-speed, which offers superior shifting prowess and easier transitions between gears compared to the 8L45. Both of these eight-speed transmissions offer a more immediate response for he driver than a six-speed thanks to smaller spaces between the gears that give it a more deft ability to switch from gear to gear. And thanks to a unique and creative arrangement of the clutches on these transmissions, each weighs less than the six-speed while taking up the same space. Also a testament to American workmanship, these transmissions are both built at GM’s Toledo, Ohio transmission facility. For any experienced Camaro driver, the quality and feeling of a Camaro’s excellent performance are nothing of a surprise. Just how these incredible sports vehicles accomplish this task, however, might have been something of a mystery. Now that you’re informed, feel free to go ahead and choose the Camaro that’s exactly right for you. When you think you’ve chosen, the friendly staff at DePaula will be here to help you pick the perfect Camaro and get on the road in no time.